Total Revenue for the quarter ended March 31, 2018 grew 7% to $3.39 billion (2017: $3.16 billion). Hotel revenue for the quarter increased to $3.29 billion relative to $2.90 billion in 2017. Interest Income decreased 15% to close at $6.97 million (2017: $8.23 million), while net investment property expense for the quarter amounted to $70.31 million compared to $16.11million in 2017. Net capital gains on financial assets and liabilities slipped 39% to close at $166.40 million (2017: $271.41 million). Operating Expenses rose 14% to $2.77 billion (2017: $2.44 billion). Of this, hotel expenses increased 10% from $2.13billion in 2017 to $1.93 billion for 2017. Depreciation closed the three months at $246.35 million (2017: $135.88 million). Interest expense for the period rose by $17.97 million to $379 million (2017: $361.02 million). 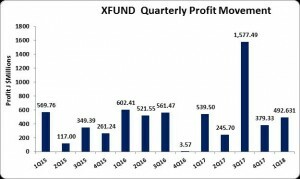 XFUND incurred other operating expenses for the quarter of $17.51 million relative to $8.63 million booked for the comparable quarter in 2017. Consequently, Profit before Tax dipped to $621.92 million compared to $722.20 million a year earlier. Following tax charges of $129.28 million (2017: $182.70 million), Net Profit decreased 9% to $492.63 million, down from $539.50 million for the comparable period in 2017. Total comprehensive income as at March 2018 was $547.80 million versus $539.23 million posted 2017 comparative period. The earnings per share (EPS) for the quarter closed at $0.22 (2017: $0.24). Twelve months trailing earning as at March 31, 2018 was $1.20. The stock was trading at $13.99 on March 31, 2018. The number of shares used in our calculations was 2,243,005,125. The company, as at March 31, 2018, recorded total assets of $48.61 billion, an increase of 8% when compared to $44.95 billion recorded in the prior year. The main driver for the increase was current asset which closed at $4.80 billion relative to $2.68 billion in 2017. Receivables as at March 31, 2017 moved from $985.71 million in 2017 to $2.30billion. Securities purchased under agreement to resell amounted to $127.36 million relative to nil in 2017. Investment property as at March 31, 2018 totaled $1.97 billion compared to $1.32 billion recorded for 2017. Property, plant and equipment amounted to $26.20 million versus $25.31 million a year earlier. Total Stockholders’ equity as at March 31, 2018 closed at $23.24 billion, a 14% increase from the $20.44 billion for the corresponding period last year. This resulted in a book value of $10.36 (2017: $9.11). A total of 2,243,005,125 shares were used in the calculation.